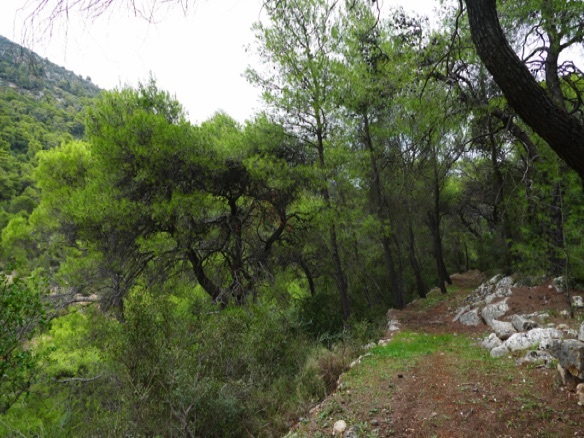 This 2500 year old country road or "healing path" that ran between Archea Epidavros and Asclepius' Health Centre in Epidavros (where the large amphitheatre is located), is a secluded gem in Argolis. 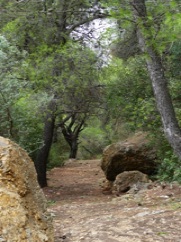 If you want to experience a walk on, probably, the oldest road you've ever walked on, you should use a few hours here. About two kilometres of road have been preserved in a virtually uninhabited piece of countryside between Ligourio and Epano Epidavros, and it's in a really scenic area. The path follows a, sometimes, dry creek that meanders through a low ravine, so you have mountains on both sides, covered with fragrant pines and other trees. You can see antique distance markers, and pedestals that once displayed statues. Here are birdsong, flowers and many good picnic stones. Many Athenians (or from thereabouts) took, in the ancient times, a trip to Asclepius' health centre, which was famous for its excellent results. The ill and their company left the boat at Archea Epidavros, and walked or used a horse and carriage to the health centre. Marks made by the thousands of wagon wheels once rolling here, still can be found on the path, but we have not been able to locate them. Every four years an Asclepius festival was arranged in Epidaurus, and then this path was transformed into a sacred way. Well, that was long ago, and now you'll probably walk this walk without even seeing a single other human being, great! Except if you go in June, because then the "Epidavros Road", is arranged a race for men and women beginning at the little theatre in Archea Epidavros and ending up at the Ancient Stadium in Epidavros. You will see plastic strips some places, marking the path of the race - not very nice, but at least you'll know that you are on the right path. You must have access to a car. From Nafplio, drive toward Asklipion / the large theatre of Epidaurus. In the eastern end of Ligourio, turn northeast toward Epano Epidavros. After about four km, you'll see a paved parking area on the left side of the road (see picture below), and here begins the ancient road. Bring water; there is nothing to buy after Ligourio. Hermit monks have lived in this area for many centuries, but in the 1400s three monks came, presumably from Kalamata or Agnountos, and built a small monastery here. 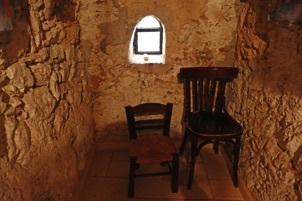 It consisted of a church, three monk cells and a common room. We can still visit the cells and the church, but around them a huge nunnery was built in the 1970ties. Here 30 nuns live and work, and they are truly enterprising women. 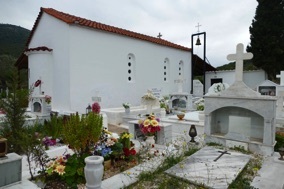 They have decorated the entire modern church themselves, they have built chapels and carved friezes in marble, they embroider and work in the garden. It is possible to walk all the way, from Archaea Epidavros to Asklipion / Epidavros. The ancient road is only two kilometers long, but there are other, nice paths and roads in the area, perfect for a long walk. The Church of Adrianos and Natalia rests in the eastern end of the path. 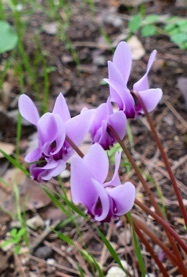 Cyclamen, growing many places on the path. They are in bloom autumn and winter.  So, they are painters, builders, stonemasons, gardeners and more, knowledgeable women who love to welcome visitors and can guide in Greek, English and German. Admission is free (just ring the bell) but please give a donation to the guide. Open until 13:00 and a few hours in the afternoon (2016). The monastery is situated on a mountainside, with expansive views, and is reached by driving past the road to Epidavros Theatre, passing Adami and further east until you see the sign with the nunneries name. 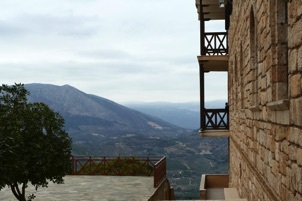 Kalami Nunnery and the view. 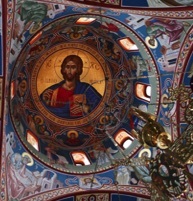 Decorations in the new church. One of the old monk cells.